1. The DM-2W analog delay sound is way different from modern digital delay. 2. It makes your guitar sound better. The coolest thing about the DM-2W’s lo-fi delay tone is how well it complements and supports your straight guitar sound. Like so many classic music tools, it produces that magical “glue” that takes an already great tone and makes it even better. While the enhanced definition of digital delays can sometimes create bouncy echo artifacts that get in the way, the analog DM-2W always supports your tone with highly musical sounds, even at extreme settings. In its way, the “murky” BBD sound straddles the line between delay and reverb, and is often preferred by many top players over a straight reverb effect (though they work really well together too—the DM-2W sounds especially luscious when paired with the new RV-6 Reverb). While discussing differences here, I should note that digital delay is in no way inferior to analog delay—far from it! As you probably know, BOSS makes digital delays too, and our new DD-500 is capable of creating a huge range of amazing delays sounds (including a spot-on emulation of the DM-2), many of which are simply not possible with analog tech. But while more limited in its scope, analog delay has a really unique character that’s simply different from the standard digital delay sound, and each type shines in specific applications. Basically, if you’re attracted to warm, retro sounds, the DM-2W delivers in spades, and might just meet all your echo needs if you like a simple setup. For more tonal diversity, many players also have a digital delay like the DD-7 alongside a DM-style delay, kicking in the former for its crisp, distinctive echo effects and super-long delay times when needed. 3. Two selectable modes give you old-school tone with modern range. The original DM-2 pedal design was straightforward and simple, offering delay times in the range of 20 to 300 milliseconds, plus that classic BBD tone. And when the DM-2W’s mode switch is on the “S” (Standard) setting, that’s exactly what you get—the real analog DM-2 sound. No emulation here! To bring more contemporary versatility to the pedal’s modern Waza Craft incarnation, the engineers at BOSS figured out how to take that sought-after original sound and enhance it with longer delay times and a slightly cleaner tone. And that’s what happens when you flip the sound mode to the “C” (Custom) setting. The versatile Waza Craft DM-2W Delay includes selectable Standard and Custom sound modes. Specifically, Custom mode nearly triples the available delay time to 800 milliseconds. That’s getting close to digital delay territory! In addition, the delay repeats are somewhat clearer than Standard mode, though the tonal quality still remains firmly in gritty analog BBD-land. Custom mode brings a lot more to the party, giving you increased range for rhythmic delays and dramatic echo effects. 4. You can create intense real-time sound effects with an expression pedal. 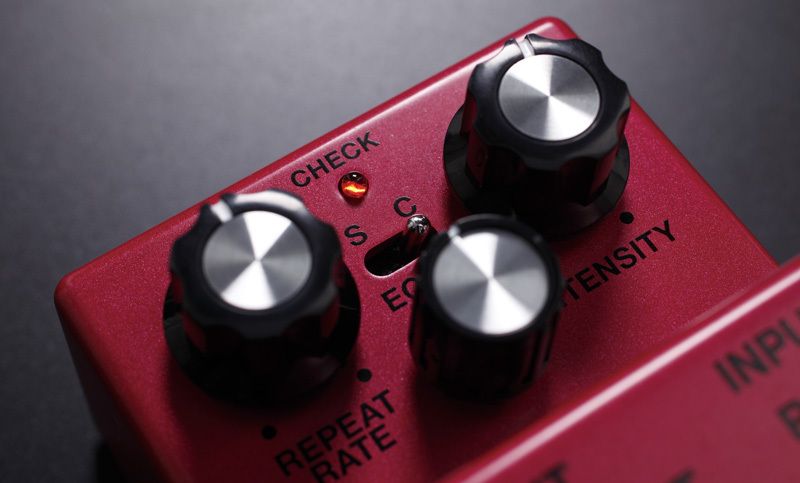 The DM-2W also includes another feature not on the original DM-2, which is the ability to connect an expression pedal and adjust the delay time with your foot. (Delay time is normally controlled manually with the Repeat Rate knob.) Beyond the obvious hands-free delay time adjustment for specific songs, this also lets you create some very cool real-time effects. If you’re playing as you adjust the time, a “warping” sound is produced, where the pitch of the delay repeats is continually shifted as it moves to its new setting. (This can also be accomplished by tweaking the Repeat Rate knob by hand, but it’s hard to play at the same time.) Used by lots of creative players over the years, this interesting expressive effect was first discovered by manipulating the time controls on early tape delays. On the DM-2W, it’s really effective with the Custom setting, thanks to the increased delay time that’s available. And after you’ve had some time-warping fun with the pedal, you might try reaching down and cranking up the Intensity knob for some way-cool self-oscillation effects as well. While we’re talking about added features, there’s one more: the DM-2W includes a Direct Out jack, which allows you to send echo and dry tones to two separate amps for a big, spacious spread. This feature was actually on the DM-3; it was the next-generation successor to the DM-2 back in the ’80s, with a very similar (though subtly clearer) sound to the original pedal. The Waza Craft DM-2W Delay includes Rate and Direct Out jacks, two features not found on the original DM-2. At BOSS, we make lots of amazing guitar products, both analog and digital. They all sound great, and they all work really well together. But if you’re an analog purist who gets nervous about digital gear in your signal path (you know who you are), rest assured you have no worries with the DM-2W, because this pedal is pure analog through and through. If you love old-school tone and methods, the DM-2W is made for you! But if you’re one who’s more open to mixing the two worlds together, the DM-2W brings a unique and powerful tonal complement to any digital pedals you might have. Guitar Interactive magazine recently put the DM-2W through it paces, and they were very pleased with what they heard. You can really get a handle on the great sounds and features this pedal has to offer in this informative video review, which also appears in Issue 35 along with a written review. They misspelled “Waza” in the video title, but we’ll forgive them for that. They also state that the max delay time is 600 milliseconds in Custom mode, though it’s actually 800. 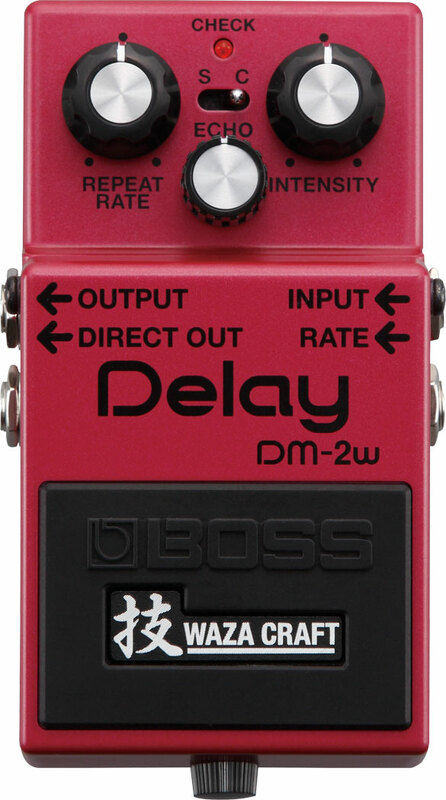 To learn more about the DM-2W, visit the product page at BossUS.com. Better yet, get down to a BOSS dealer and play one for yourself! While you’re at it, you might also want to check out the BD-2W Blues Driver and SD-1W Super Overdrive, two additional pedals in the BOSS Waza Craft series.